I'm actually going to be volunteering for the festival and donating some large sustainable arrangements (I'll post the photos this week). I'll also be checking out new ideas I can use in my business and in my life (my husband wants to get a small wind turbine for our front yard... in Oakland) and making connections with other green-minded folks. One connection I've already made is going to be there, and I look forward to seeing their hemp silk bridal attire at a fashion show Friday and Saturday night. They're called Conscious Clothing and you can check out there stuff here: www.getconscious.com Here are some beautiful examples of the things they can do. What I like, is that they do custom designs. Here is the dress with all the layers, but you can unzip the last three and make it shorter. 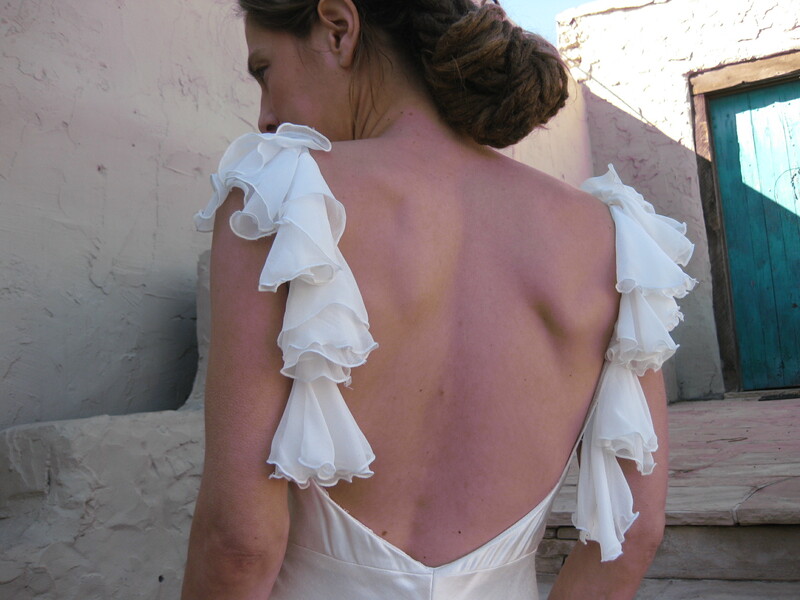 I love the low back and silk ruffles of this dress. So if your in or around the Bay, definitely come check out the SF Green Festival this coming weekend.